Here we share the best paint finish for a living room including ideas for when to use each paint type. One of the easiest ways to spice up a living room is by updating the wall paint. It instantly makes the room seem newer and more interesting. It is also less expensive than revamping all of your furniture. 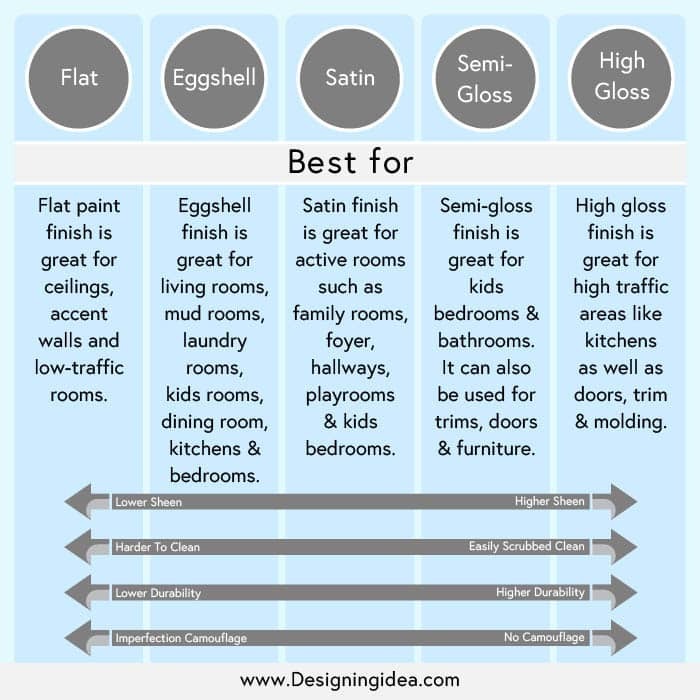 Before heading out to the store to pick up your new wall paint, it is best to determine which finish works best for the room and its overall color palette. Paint has different types of sheen. The sheen depends if absorbs or reflects light. Each type of paint finish has its own pros and cons. They are also more appropriate for specific types of rooms depending on their durability and convenience in cleaning. Below we take you through the different types of paint finishes from the one with the least amount of sheen to the shiniest. 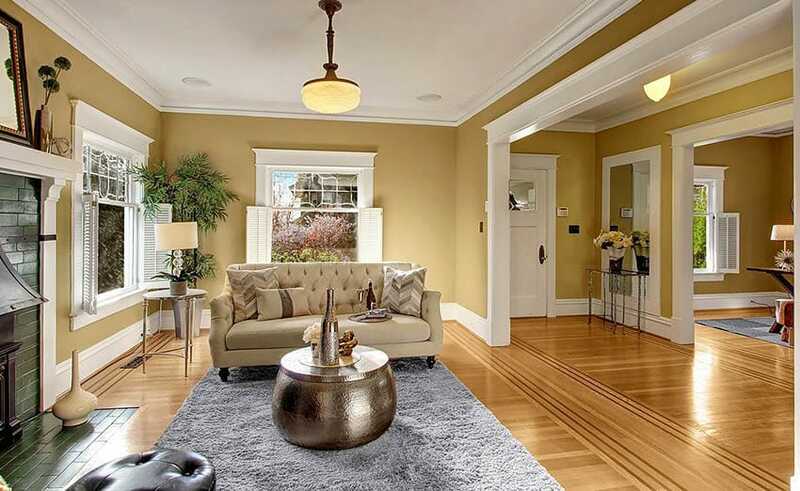 For more ideas check out our gallery of living room paint colors. The flat paint finish is also known as a matte finish. As the name dictates, this type of paint finish has the least amount of shine and does not reflect light. This quality allows the paint to cover up imperfections on walls such as bumps and small cracks. It is also the best choice for textured walls because it is smoother over rough surfaces. However, flat paint is harder to clean and thus not advised for high traffic areas such as bathrooms or kitchens. It is also the least durable of all the paint finishes. The flat paint finish is great for ceilings, accent walls and low-traffic rooms that do not need constant cleaning. Just like its name, this paint finish has a slight sheen that can be found on egg shells. The eggshell finish has more luster than the flat paint finish. It also resists stains better and is easily cleaned with a wet rag. This finish is also used for decorative purposes. It is best to use this paint finish in rooms where a little bit more durability is needed such as mud rooms, laundry rooms, kids’ rooms, dining room, rec rooms, and bedrooms. It is a great choice for walls because of its “just right” sheen. The satin finish has a slight luster compared to the semi-gloss finish. It is more durable and has higher sheen compared to the eggshell finish. Compared to its lower sheen counterparts, the satin finish is easier to clean. This finish is ideal for more active rooms such as family rooms, foyer, hallways, playrooms, and kids’ bedrooms. Due to its high durability, this finish can also be used outdoors. The satin finish is also used on window trims, door trims, and shutters. The semi-gloss finish reflects light which causes its shiny appearance. In terms of durability, it is tougher than the eggshell finish and will show less wear. It stands the best to water and cleaning, which is a big convenience for rooms that need to be cleaned constantly. The semi-gloss finish is recommended for kids’ bedrooms and bathrooms. It can also be used for trims, doors, and furniture. The semi-gloss is perfect for rooms where moisture, drips, and grease stains are abundant on walls. Out of all the types of paint finish, the high-gloss is the most durable and easiest to clean. It is hard, ultra-shiny, and light reflecting. This type of shine is the best choice for cabinets, trims, and doors. However, this finish has too much shine for interior walls. Its sheen will highlight nearly all of the imperfections on the walls. The high-gloss sheen is great for high traffic areas like kitchens because of its convenience in cleaning. The living room is usually the first room you set foot on when entering a house. Some houses have a formal living room used only to receive guests, which means that the family does not use it for social events or as a common room. 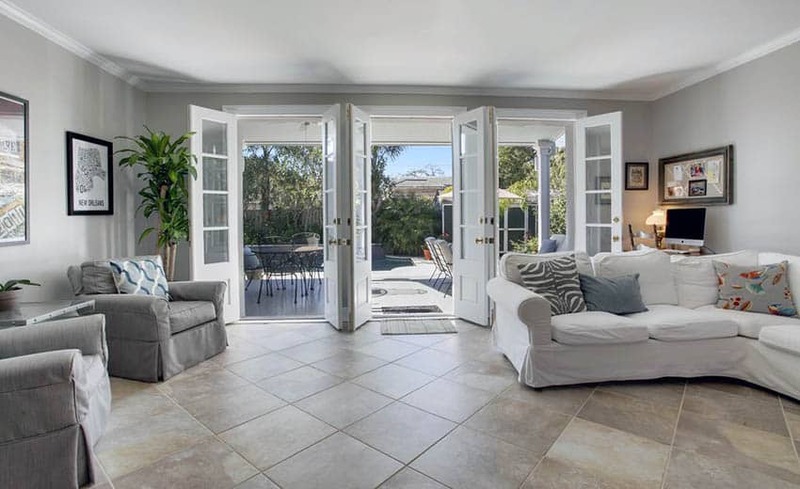 Smaller houses usually have living rooms as the family rooms as well, so it has high traffic because it is used as well for entertainment and social gatherings. 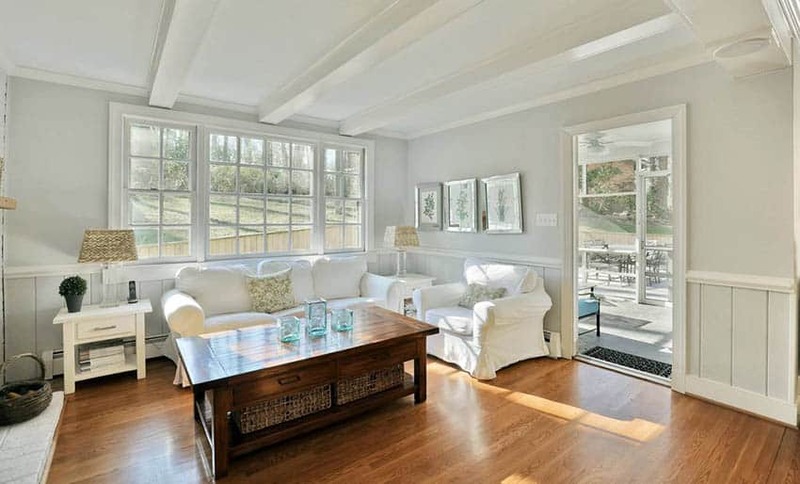 The best paint finish for formal living rooms is often flat paint. It hides imperfections on the walls. The formal living room does not need frequent clean up as it is a low traffic area which is great for this type of paint finish. 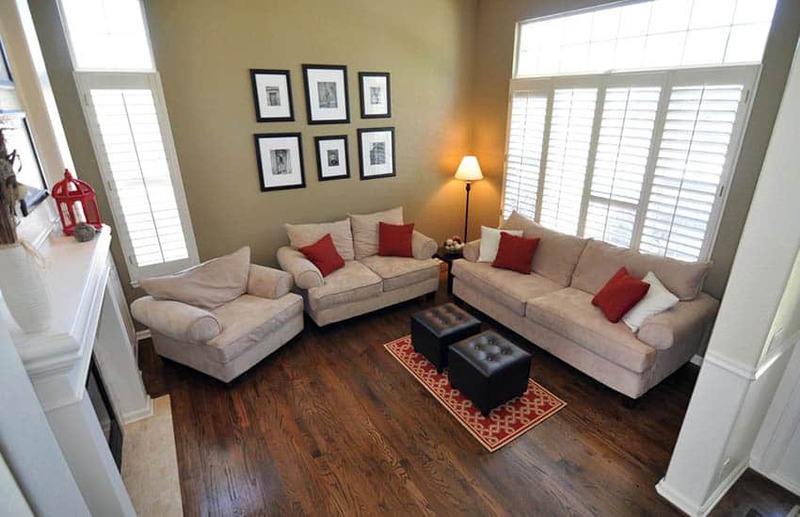 For living rooms that also serve as high traffic family rooms, the best paint finish to use is often eggshell or satin. Eggshell can be easily cleaned so any spills and drips can be wiped with a wet rag. While satin finish is more durable than eggshell, it is ideal for active rooms like playrooms. Visit this page for even more living room paint ideas to help you find the best color for your design. If you have found the color you like there are paint color apps which can tell you the name of the paint so you can bring your idea to life.